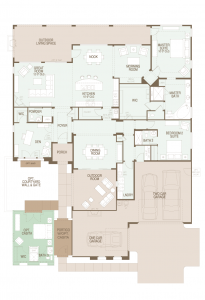 The SaddleBrooke Ranch Montera Floor Plan is NO LONGER OFFERED for New Construction homes. RESALE homes are AVAILABLE with the Montera Floor Plan. The Montera Floor Plan is the largest in the Estate Series of Homes at SaddleBrooke Ranch and has 2,808 SF with a Casita option. For the couple that looking for a spacious, yet comfortable, retirement home or winter retreat, the SaddleBrooke Ranch Montera Floor Plan may be perfect for you. You have the right to be represented by a Realtor when buying a new construction home. BUT your Realtor MUST be with you on your FIRST visit to the new home builder’s sales office and register you! You will not pay more to have a Realtor represent you when buying a new construction home in Tucson, AZ. The sales agent at the builder’s sales office works for the builder, NOT YOU! They will ask you to “register” when you come in – or shortly after. If you register, you are GIVING UP YOUR RIGHT to be represented by a Realtor at that builder’s site in the future. Chances are the builder’s sales agent WILL NOT disclose this to you! If you register at the builder’s site, you are on your own to work through the builder’s contract and all purchase decisions. Yes, the builder’s sales agent will work with you through the paperwork. They will answer your questions. BUT with who in mind? You or the builder they work for? Will they tell you there are homes for sale with the floor plan you want that may be less than it will cost you to build it? Considering A Home In SaddleBrooke Ranch? Are you thinking of buying a home in SaddleBrooke Ranch or another 55+ adult community in Tucson? Thinking About Selling Your Home In SaddleBrooke Ranch? And the photos on the mls make a difference. You can spend lots of money on home staging. But if that effort isn’t correctly show in the MLS photos, you are not getting the full benefit. For luxury listings, our drone service provides video of your home and neighborhood. This video along with professional photos helps the online buyer see and feel your home. Their “new” home. If you are considering a Robson Resort Community home in SaddleBrooke Ranch, SaddleBrooke or Quail Creek give us a call. We would be pleased to discuss your home buying interests and the many Tucson AZ lifestyle choices.